There have been many outstanding women endurance runners in Scotland in my time in the sport but very few have made it to the Olympics. Liz McColgan, Yvonne Murray, Karen McLeod – and Lynne McDougall. I remember one of the very good senior men I was coaching in the late 1980’s phoning me after a road race with the boast that he had out-kicked an Olympic 1500m finalist! It was Lynne that he outkicked. 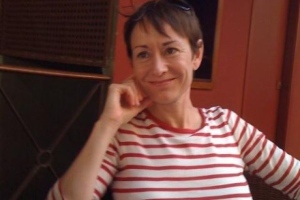 Although she is now perhaps better known as a top class road and marathon runner, she ran in the Los Angeles Olympic final back in 1984 and was also an outstanding 800 metres and cross-country runner. There were also representative races over the country with three runs in the World Cross-Country Championships at Madrid (as an Intermediate), Rome and Gateshead and a GB vest on the road when she ran a 6K leg of the Yokohama Ekiden Relay. A popular member of any team, she is said to be incredibly good at impersonating people – and she was particularly good at doing a couple of Scottish athletics officials! There was one occasion when with a Scottish team in Italy she wanted honey for breakfast and was reduced to flapping her arms like wings and saying “Bzzzzzz!” She was however superbly talented and the range of her abilities and length of her stay at the top can be easily shown by her appearances in the Scottish and British All-Time ranking lists. Add in one Olympics and two Commonwealth Games and you have an idea of the quality of which we speak. How about championships won? Scottish Senior victories in the 1500m were in 1982 (4:16.2), 1986 (4:10.23), 1988 (4:13.99), 1989 (4:08.14) and 1996 (4:30.05); SWAAA 3000m in 1991 (9:24.43) and 1993 (9:28.45). In the AAA’s Indoor Championships she won in 1984 (4:16.89), 1988 (4:26.00) and 1989 (4:21.96); in the WAAA Under 17 championships she won in 1981 (4:25.76) and 1982 (4:27.0) and in the WAAA Under 15’s Lynne won in 1979 (4:34.34); In the UK Championships proper she finished second to Zola Budd in 1984 (4:10.80) and won in 1989 when Zola Budd was history in 4:11.31; she won the CAU 1500m in 1996 in 4:21.85 and won the British Schools International in 1981 in 4:25.39. What a record. I can’t think of another Scottish athlete – male or female – with such a list of successes. She seems to have been competitive from the very start – Fiona Meldrum says that they both ran their first race at the same time (they were 9 or 10 years old at the time) and remembers it as being a very hard race for both of them. But Lynne’s story is also one of a catalogue of disasters defeated and hardships overcome; disasters that would have seen a lesser athlete, whatever the talent, depart the sport. Lynne has answered the questionnaire and, before looking at her career in detail, we should read what she has to say. How did you get involved in the sport: I loved running from when I was very young and have vivid memories of testing myself running various distances in Primary 1 and 2 in Ayr. When I moved to Glasgow with my family I went to Simshill Primary and became friends with Andrea Calderwood whose dad, Bobby Calderwood, was of course a very good runner. We went along to Victoria Park and I was lucky that the middle distance coach at the time was Ronnie Kane who was, I think, one of Scotland’s best ever coaches (although probably underrated). I was 9 and began to compete in cross-country. Has any individual or group had a marked influence on either your attitude to the sport or individual performances? Two of my coaches have had an important influence on my athletics. Ronnie Kane, my first coach, provided an excellent introduction to the sport and a firm basis for development. He was wholly committed as a coach and had an intelligent and methodological approach. He encouraged all of the people in his group, no matter their abilities, to be as good as they could be. His attitude was far from the parochialism we sometimes see in Scotland now – our key championships were always the AAA’s and the English National Cross-Country Championships and we often went to England seeking fast races. My second coach, John Anderson, also had a very important influence. I was introduced to John by Jimmy Campbell (who coached Christine and Evelyn McMeekin). I was not sure what to do after Ronnie Kane died in 1982 and had no coach. I linked up with John prior to the European Junior Championships in 1983. Not all of John’s athletes were international athletes at that time, but the majority were and this made me feel that I should emulate their approach to training, racing and life style. This kind of group atmosphere, mixing with well known athletes through John’s contacts, and John’s training programmes which emphasised a lot of quality running helped me to improve rapidly. Within a year of starting working with John I had knocked 5 seconds off my pb for 800m and 10 off the 1500m. I never ran was well as I did in that 1984 season for a range of reasons but I continued to work with John on and off over the years. When I eventually began to train for the marathon I again sought guidance from John – he is one of the most knowledgeable athletics coaches in the world. My partner, Allan Adams, has had an important influence on me in my latter years. I learned a lot about long distance running from him and he helped me in training. He has a very professional approach to training. I particularly like his attitude to racing where he is competitive but also pleased to see others do well. If he has a bad race he bounces back very quickly and stays very positive. What exactly do you get out of the sport? I used to enjoy winning races or doing well – it gave me a great sense of satisfaction! There have been times when I have been fit and I know that I pushed myself to the limit. I cannot imagine going through life and never experiencing this. This means that despite not achieving all the things of which I think I was capable there have only been a few times when I have abandoned running (and even then I only stopped competing but continued to run) so it defines me and is a constant source of well-being. More prosaically, through running I have been able to see the world. I would never have been able to see all of the places I have visited otherwise. I have also met many remarkable people from all walks of life, countries and backgrounds. I would never have been able to meet all of these people without being involved in a sport like this. Can you describe your general attitude to the sport? I don’t think that I have a general attitude to the sport. It has been different at different times of my life and at different parts of my career and I must admit that I have struggled sometimes to achieve the right mental approach because I have let external factors and my emotions distract me. From observing successful athletes I think that there seem to be a few common factors in their attitudes including love of the activity of running (not just winning), self belief, focus on their own performance and a positive outlook. Only some people are born with such an attitude and the rest of us have to learn these things. What do you consider to be your best ever performance? I think I ran well at the Scottish Championships in 1989 when I set a new Championship record. I had a lot of personal difficulties at that time and yet I was able to overcome them on that day, win and get the Commonwealth Games qualifying time that I needed to go to Auckland in 1990. I got my attitude right that day! And your worst? That’s easy! In 1998 I ran in the AAA’s 5K. My heart was not really in it and I was over-anxious and stressed before the race. Not surprisingly I started badly, and the gradually got slower and slower until I was walking and then I walked off the track. That is the only race I have ever not finished and I never competed on the track again. What did you do apart from running to relax? To relax – the usual things … sitting around and watching telly! I have no other talents such as other sports or arts so did not have any hobbies. However I do think that it is important to have other interests. I qualified as an addictions counsellor and did a Masters while I was running. What goals did you have that are still unachieved? Many! I ran my fastest times while I was still a junior when I was certainly not training as hard as I could. A variety of factors in the years after that made it difficult for me to put in place all the things that need to come together fro an athlete to be successful. What has running brought you that you would have wanted not to miss? The opportunity to compete in many different parts of the world. I found some of this stressful but at the time it was very exciting. Taking part in major games like the Olympics and Commonwealth Games was particularly exciting because in addition to the competitions these brought along with them a lot of opportunities such as meeting new people or travelling to new places. Can you give some details of your training? Two things that I think are important are intensity and being specific in training. The first means that you have to spend quite a lot of your time running fast if you want to be a serious athlete. This means at race goal pace and faster. The second means focusing on the training that is specific to your event. So if you want to be a track runner you need to do track sessions! I trained on the track 3 times a week when I was a track runner. I am inclined to think that people are not really training intensively enough or specifically enough these days. When I was competing on the track my key sessions were: 8 x 300 with 3 minutes recovery; 4 x 600 with 5 minutes recovery; 3 x 1000 with 7 minutes recovery; plus sprint sessions like 150 -200 – 150 in increments of 10m with walk back recoveries. I also ran 3 – 4 miles fast once a week and ran an hour or 10 miles once a week. I trained twice a day with a total mileage of around 60 miles a week. Tuesday: am 5 miles pm Track session, eg 1000m/600m x 5 with same distance jog recovery. Doug Gillon, in an article in the ‘Herald’ suggests that the first indicator of her ability was in the winter of 1976 when she won the Scottish Under-13 championship from Linsey Macdonald who would also be an Olympic finalist, albeit in the 400m in Moscow in 1980. Her record in the Scottish National Cross-Country Championships at the beginning of her career was exceptionally good: in 1977 she was second in the U-13 Championships which she won the following year. Missing the championships in 1979, she won the U-15 championship in 1980 and in 1982 she won the U-17 National. As an U-20 in 1985 Lynne finished fourth in the Senior National which she won in 1985. But good as that record was, a better indicator might have been her track running in the same year. As a ‘Girl’ (ie Under 13) Lynne ran an 800m in 2:21.9 which had her at the top of the age group rankings but it also placed her fourth Junior (Under 15) and fifteenth Intermediate (Under 17); her 1500m time of 4:52.3 was also top of her age group but placed her second Under 15, third Under 17 and nineteenth Senior! At this point she was training with an excellent group under the guidance of Ronnie Kane who had been a Scottish cross-country internationalist and a regular and dependable member of the outstanding Victoria Park team of the 1950’s. The group contained such excellent athletes as Fiona McQueen. Judith Shepherd and Janet McColl, all of whom made the difficult transition to senior athlete having negotiated the pitfalls on the way up that lose the sport so much talent. After winning the National in 1978, Lynne had another good year as an Under 15 on the track. She won the West District 800m in 2:22.3 and was second in the East v West fixture in 2:15.0. At the SWAAA it was the 1500m that she tackled and won in 4:46.5. The 800m time ranked her second in her age group and her 1500m best for the season of 4:39.8 topped her age group. 1980 had a third place in the WAAA Under-17 indoor championship 800m at Cosford in 2:10.6.In 1981 she tackled only one senior championships – that was at the West District 3000m which she won in 9:53.4 – preferring to run at the Intermediate Championships where she won the Scottish in 2:11.9 and the East v West which she also won (2:10.0). In the Intermediate rankings she was fifth in the 400m with 58.2, first in the 800m with 2:08.9 and first in the 1500 with 4:23.8. Lynne ran in two women’s internationals that year. In the match at Meadowbank against Denmark and Eire she was fifth in the 1500m in 4:29.8 and in the match against Norway and Wales at Ardal in Norway she was again fifth in 4:24.6. It should of course be noted that she was racing against senior women of international standard. Her travels that year included Antrim, Oldenburg (West Germany), Ardal, Dublin, Birmingham and Crystal Palace as well as the Scottish circuit. She was at this point still a pupil at King’s Park High School. Her performances showed a remarkable consistency for a 16 year old: often enough a young runner has one or two or even three performances in a season that rank with the best of the Seniors but Lynne had many more than that. Her 1500m performances in 1981 included: 4:23.8 (Antrim, 24/5), 4:24.7 (Oldenburg, 13/6), 4:24.7 (Grangemouth, 28/5), 4:24.7 (Ardal, 29/8), 4:25.6 (Dublin, 4/7), 4:26.9 (Birmingham 19/9) and 4:27.1 (Crystal Palace 25/7). On the Women’s All-Time lists her 4:23.7 that year placed her ninth on the seniors list but first on the U-17 list to equal her top rankings for the U-15’s and U-13’s. An outstanding year by any measurement. If 1981 was good, 1982 was better! At the age of seventeen, she had no fewer than five times in the Senior women’s rankings with the best (4:15.7) being third behind Christine McMeekin (4:14.87 and Yvonne Murray (4:15.1). Her best 800m time of 2:06.87 was fourth and she was even in the 400m lists with 58.3 seconds. At the end of the season she had moved up to fourth on the all-time list. It was a time when the standard of women’s middle distance running in Scotland was good – her rivals included the McMeekin twins, Yvonne Murray, Andrea Everett and Elise Lyon (Wycombe Phoenix). In the SWAAA senior championships, she won the 1500m from Christine McMeekin with 4:16.2 to Christine’s 4:16.7 while in the West Championships she was second in the 800m with 2:14.7 and in the schools championships she defeated Andrea Everett with 2:09.6 to 2:11.8. There was a women’s international that year in Maribor, Yugoslavia against England, Yugoslavia and Spain and Lynne was again in the 1500m where she was sixth of the eight runners with a time of 4:18.19. Her racing venues in 1982 included Crystal Palace, Maribor, Cwmbran, Amsterdam as well as all the Scottish venues. 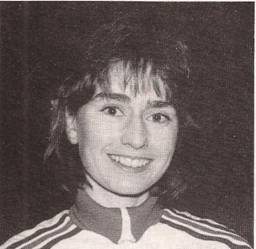 1984 was Olympic year and Lynne started off on 14th January winning the indoor 1500m in the WAAA Championships at Cosford in 4:16.89 and in the international fixture two weeks later she represented Britain against the GDR and finished third in 4:14.11. The next result of any consequence was in May in the UK Championships at Cwmbran when she was second in 4:10.81. Two weeks late, on 10th June, at Gateshead in the Olympic trials Lynne was second in 4:06.99. Eighteen days later in Oslo Lynne was second in 4:09.27. The Olympics were in Los Angeles in August and the Soviet bloc boycotted them in retaliation for the American boycott of the Moscow Olympics in 1980. Nevertheless the standard was very high indeed and in the 1500m for Britain Lynne was accompanied by Christine Boxer and Chris Benning. Her first race in the arena was on 9th August and she finished fifth in the second Heat in 4:09.08 to qualify for the final. Two days later in the final, Lynne was eleventh in 4:10.58. As a nineteen year old, the youngest in any endurance race final at the Games, she could not have been disappointed in this result although the papers made a big deal of Lorraine Baker – 20 years old – who made the 800m final and even more of Zola Budd. The actual race was fascinating with the issue in doubt right to the last few strides: the field was still bunched with 600 metres to go and Lynne was in the bunch – have a look at the race on YouTube, just go to 1984 Olympics and then type in Women’s 1500m and you’ll get it. Lynne has this to say about the Games: “This was a wonderful experience. People were very kind to me because I was one of the youngest members of the team. I think I could have run better in the final if I had been better prepared mentally. However this was only me second senior GB vest!! !” It should be noted that at this point many of the top Eastern European women, and some others too, were suspected with good reason of having used drugs to reach their peak and of course the whole thing came to the surface in 1988 with Ben Johnson’s disqualification and the many stories about other medal winners. She was probably ‘cleaner’ in this respect than several ahead of her. Two weeks after returning from Los Angeles, Lynne raced to 2:01.11 for 800m at Crystal Palace which was a Scottish record that still (September 2011) stands. Two days later in Budapest she was fifth in 4:05.98. Still racing in September she was fourth in the Mile at the IAC meeting at Crystal Palace in a time of 4:30.08 on 7th September and on the sixteenth on the international against Yugoslavia in Karlovic, Lynne was third in the 800m in 2:02.37 to bring the curtain down on a very successful summer season. 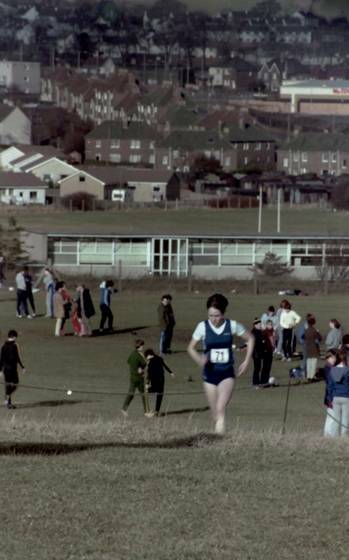 She won the Scottish Universities Cross-Country Championship at the start of the 1986 (it was to be six years before she ran over the country again) and she is pictured at the top of the page crossing the finish line. All these races were in the early part of the year. 1986 however was Commonwealth Games year – and they were to be held in Scotland too. There were many complaints about the size of the team, the selection procedures and the whole financing of the Games but Lynne made sure that she was selected when she won the SWAAA Championships in June with a time of 4:10.23 on 14th June. The report in “The Glasgow Herald” said: Since her appearance in the Olympic 1500m final, Miss MacDougall has suffered prolonged injury problems. That doubled with the build-up to her final examinations for a degree in psychology at Glasgow University continued to hamper her. Last week she struggled to finish a detached sixth in the women’s 1500m before completing her finals in midweek. But she produced a gutsy performance clinging grimly to the shoulder of Dundee’s Liz Lynch before striking for home from 280 metres out, slicing six seconds from her own championship best.” On 19th July she ran a very good 1000m at Birmingham where she finished sixth in 2:38.67. The Games started on 24th July and became known as the Boycott Games as 32 nations stayed away in protest at the Thatcher Government’s links with apartheid South Africa. 26 nations attended however. Lynne was in the 1500m representing Scotland along with Yvonne Murray and Christine (McMeekin) Whittingham. Qualifying for the final she finished in a time well below her usual – 4:17.25 in eighth place while Yvonne was fifth in 4:14.36 and Christine was eliminated in the Heats in 4:33.01 when finishing sixth in the first Heat. Lynne’s own take on the event is as follows: “I struggled over the 1985/86 winter after being out all of the 1985 season with the knee injury. It was really difficult to get back to the shape I had been in at the beginning of 1985 where, as I think the Scottish Cross-Country win over Yvonne Murray indicates, was probably the best shape I have ever been in. At least I made the final!” The season ended on 8th August with a Mile at Crystal Palace in 4:34.10 in the IAC/GP meet. By the end of 1986 she was in four separate Scottish ranking lists: sixth in the 800m with 2:04.4. third in the 100m with 2:38.67, third in the 1500m with 4:10.23 and first in the Mile with 4:34.10. Lynne did not turn out in either the West Districts or the UK Championships but did race in the Scottish Championships at Crown Point on 19th June where she was second to Karen Hutcheson. The ‘Scotland’s Runner magazine reported as follows: “Karen Hutcheson led from the start with an even paced 66.54 for the first lap and a time of 3:04.75 at the bell. Behind her, a slow-starting Lynne MacDougall fought back, closed on Jill Hunter, and passed her on the last bend to take second but victory was Hutcheson’s in a personal best of 4:14.04. Placings: 1. K Hutcheson 4:14.04; 2. L McIntyre 4:30.47; 3. J Hunter 4:21.24.” By the end of 1987, Lynne was second in the 800 (2:04.67), third in the 1500m (4:11.27) and third in the Mile (4:13.24). Running at that level is of course an expensive business and in May 2009 there was an announcement of a marketing campaign organised by Dundas Marketing in Edinburgh for several of John Anderson’s group of athletes including Lynne, Liz McColgan and Lynsey MacDonald with Dave Moorcroft also on hand. The article in ‘The Glasgow Herald’ of 10th May 2009 is worth looking at it is easily found on the internet. 1987/88 would be much more active for her. 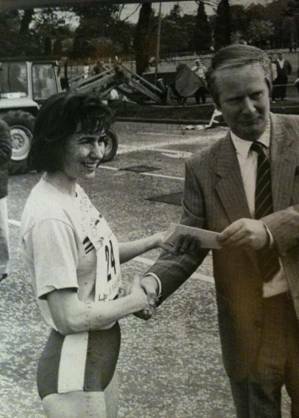 On 7th November she was second woman in the Glasgow University road race in 26:15 behind Sandra Branney’s 25:18. On 20th December she dropped a distance or three to win the West District Indoor 800m championship with a time of 2:13.1. Into 1988 and Lynne won the Springburn Harriers Jack Crawford Memorial Road Race in 29:20 and then the Nigel Barge Road Race in 26:08. On 23rd January she was second in the AAA Pearl Assurance Indoor 1500m at Cosford in 4:26.50. Two high profile indoor 1500’s followed and were reported in ‘Scotland’s Runner’ as follows: “Lynne McIntyre, disappointed to lose out in the tightest of finishes at the Dairy Crest International at the Kelvin Hall, had only a week to wait for revenge. The Glasgow AC woman had been given the same time, 4:18.27, as Bev Nicholson against France but eight days later, competing against Belgium and Holland at Ghent she had eight seconds to spare over Nicholson as she clocked a season’s best of 4:16.39 to finish second.” The good form continued into summer 1988 where she finished fifth in the final of the TSB/Kodak Olympic trials in 4:12.50 while Karen Hutcheson was eighth in 4:15.85. On July 22nd in the Scottish Championships at Crown Point track in Glasgow Lynne again defeated Karen Hutcheson in a field that was considerably better than the previous year. ‘Scotland’s Runner’ again: Lynne McIntyre, showing some welcome signs of returning to form, relieved Karen Hutcheson of her 1500m title after the duo had dropped Chris Whittingham about 700m from home. In the end, McIntyre won comfortably putting in a sub-66 second last lap to pull clear. 1. L McIntyre 4:13.99; 2. K Hutcheson 4:18.06 By the season’s end she had best times of 2:05.46 for 800m (fourth ranked), 4:12.50 for 1500 (third ranked) and 9:35.1 (sixth ranked). Lynne (13), Abrahams (21) are both clear, Bevan is behind Lynne in the black vest and Anderson is immediately behind number 16. At the end of 1988, the Commonwealth Games guidelines for 1990 were released and for the women’s middle distance races they were 2:02 (A Standard) and 2:05 (B standard) for the 800m, 4:08.5 and 4:15.0 for 1500m and 9:00 and 9:15.0 for the 3000m. Lynne knew her targets from that point. Ending 1988 with a victory in the Glasgow University Road Race in November, there is no record of her competing indoors or on the country in winter 1988/89 with the first run in 1989 being n the Dunky Wright Road Race in Clydebank where she defeated Sandra Branney to win in 29:26 to Sandra’s 31:02. On the track, in the HFC Bank UK Championships in Jarrow Lynne won the 1500m in 4:11.31 from Alison Wyeth (4:13.33) and Sonia McGeorge (4:14.24). It was reported by Doug Gillon in the July 1989 issue of ‘Scotland’s Runner’ thus: “A new Scot on the gold standard was Lynne McIntyre (1500m) clearly almost back to the form which earned her an Olympic final place in Los Angeles. She was rewarded with 800m selection for the International Select at Portsmouth the following week.” If this was a good run she excelled in the Scottish Championships at Crown Point. This was one of the years when the governing body saw fit to invite a ‘squad from abroad’ to compete on the excuse that they were raising standards in the championships – we had the Australians at Meadowbank but this year there was a visiting team of Indians taking part. However in her favourite event, the 1500m, the report read as follows: “This was clearly a two-horse race as Lynne McIntyre and Karen Hutcheson left the pack early on to take on a duel of their own. They set up a fast pace and constantly increased the gap between themselves and the rest of the field. The two stayed together into the final lap. the split time at that stage being 3:02.73. With 350 to go Lynne started to pull away from Karen and started her long sprint for home. Karen was unable to respond to this sudden burst and at the end of the race there was about 20 metres between them. Lynne’s time of 4:08.14 beat her own championship best performance by over two seconds and was within the Commonwealth Games selection standard of 4:08.50. 1. L McIntyre 4:08.14; 2. K Hutcheson 4:12.26; 3. Laura Adam 4:18.44.” (Adam had already won the 3000m on the previous evening. Not content with that, the report for the 800m reads: “Lynne McIntyre and Sue Bevan took up the running in the first lap of the 800m, the final of which was only one hour and twenty minutes after Lynne’s excellent 1500m victory. The pace was unhurried as they went through the bell in 64 seconds. With 300 to go Lynne took the lead in a bid for home and was closely followed by Sue Bevan and Mary Anderson. By 200m to go, Sue was putting on the pressure and then Mary started to come to the front at the 150m mark. Into the straight and any one of the leading pack could have won. As they neared the finish, Mary Anderson seemed lost for pace ad India’s Shiny Abrahams seemed to come from nowhere to take the lead. Lynne McIntyre made a valiant bid to catch her over the last few metres and almost did so, but Shiny had just made it to the line to win. 1. S Abrahams 2:06.72; 2. L McIntyre 2:06.77; 3. M Anderson 2:07.76; 4. S Bevan 2:08.32.” (Anglo-Scot Sue Bevan was comparatively young at this point but she was to go to become a Scottish International track runner over 800m both indoors and out in the 1980’s) Lynne now had her qualification for the Games and at the end of the summer in 1989she was ranked second to Yvonne Murray in both the 800 (with 2:03.43) and 1500 (4:08.14). When it was announced that only 22 athletes would be selected for Auckland with only ten of them women, there was a real stushie with SAAA Secretary Ewan Murray pilloried for saying that no one would go ‘just for the trip’. Ruth Booth the women’s team manager was ‘upset and amazed’ at the lack of places and the SWAAA complained formally. Nevertheless the team went as selected and Lynne was there. November 1989 was another victory for her in the GU Road Race – this time in 26:15 for the 5.5 mile course from Ruth McAleese (27:34). In February 1990, Doug Gillon previewed the Commonwealth Games in ‘Scotland’s Runner’ and had this to say about Lynne: “Lynne McIntyre with solid warm-up outings at 1500m and 800m is beginning to regain the form which took her to the Olympic 1500m as a teenager, and cannot be dismissed as a medal prospect in the metric mile.” Further through the same issue of the magazine in an article entitled ‘For Love Or Money’ which dealt with the difficulties for athletes of trying to balance a full-time athletics life style with the need to earn money to put bread on the table, the following comments were made: “At least £10,000 a year is what several of the Auckland Scots calculate athletics is costing them. …. For McIntyre that Commonwealth Games equation came true in 1986. The 13th Games in Edinburgh provided the scene for her proudest moment in a successful international athletics career. Wearing the dark blue vest of Scotland in Meadowbank was more fulfilling to the Glasgow woman than any of the other numerous occasions when she has competed for Scotland. “At Commonwealth Games time it becomes very important to be Scottish,” Lynne says, “and because they are the ‘Friendly Games’ as well, it is so much better that we compete as a small country.” ….. “I think that if we competed as a British team the Games would be viewed in a different light – it would be just another competition. A further reason is that the English are so good they would make up most of a GB team” ….. The Commonwealth Games can provide Scottish athletes with the level of competition to inspire them and to promote pride in themselves and in their performances. Not all international appearances for Scotland can do this, as Lynne recalls, “I think the worst I have ever felt in a Scottish vest was when we competed against Birchfield Harriers and the Midlands. There we were – a National team – taking on a team from an English club and a region! It was an opinion of our standards before we even started.” (I should maybe add, that for many years after this the same fixture continued – it was designated a ‘Scottish Representative’ team and a ‘Representative fixture’ with the word ‘International’ carefully avoided. The Midlands Select was always of a very high standard and it was not at all certain that we would beat them. To add to the lack of a sense of occasion, the vests and tracksuits were issued to the athletes and taken back again afterwards! I remember coming back after one such encounter at a time when the Scottish kit supplier was changing from Asics to Nike: the track suits were issued, taken back again and then a sale was held on the bus with the track suits going for £5 each! Only the green eye-shades were missing). By the end of the year she was second in the 800m rankings with 2:04.43 to Yvonne Murray’s 2:03.57 and third in the 1500m behind Liz McColgan and Yvonne with 4:08.88. Still plagued by injury, there had been times when it seemed that she would not be able to run in Auckland but with a lot of medical assistance, she did and that made the year a big success. There was however a price to pay in the form of operation on ankle tendons. As it turned out, other than that, Lynne did not race at all either on the road, on the track or over the country. It looked like the end of a first rate career in the sport …… it looked like it but there was more to come. There were Olympics in 1992 and Lynne was never one to pass up on a challenge! There was an article in ‘The Herald’ on 13th January 1992 by Doug Gillon which began: “Lynne McIntyre, racing cross-country for the first time in six years, captured the Scottish closed 4000m title from defending champion Vicki Vaughn yesterday at Irvine and earned herself a certain place in the Scottish team to contest the world championship trial at Basingstoke on February 9th.” Not just back in business but straight in at international level! The race was run in perfect conditions on ‘a perfect course’ at Irvine Riverside in an extended version of the article in ‘Scotland’s Runner of February 1992, she told Doug that there had been a planned progression back to racing fitness. she knew that if the tendons broke down she was finished. But now? “I’m quite motivated about Barcelona , at either 1500m or 3000m, but my times haven’t improved for seven years . and after so many disappointments I’m reluctant to admit to Olympic possibilities, even to myself.” Doug added that it was a ‘timely boost’ for McIntyre after several seasons when her career teetered on the brink. The result of the race was – 1. L McIntyre 15:09; 2. V Vaughan 15:15; 3. A Rose 15:32. But nothing was ever easy for Lynne. ‘Scotland’s Runner’ again: “National 4000m champion Lynne McIntyre who entertained hopes of a medal, withdrew just before the gun with a leg muscle problem and required minor surgery on her return. She expects to be back in training in a fortnight.” It didn’t turn out well for her though and she was absent from the SWAAA Championships and the Olympic Trials nor was she ranked in any event at all at the end of the year. Her next appearance in the Scottish Championships was on 10th July 1993 at Grangemouth when she won the 3000m in 9:28.4 from Sue Ridley (9:34.9). “… Lynne McIntyre regained the 3000m title, breaking clear at the bell from last year’s winner Sue Ridley …. she proved that she has regained her appetite for the competitive fray,” reported Alasdair Fraser for ‘Scotland’s Runner. But it was not until the end of 1995 that Doug Gillon wrote the following in the ‘Herald’ under the headline ‘McIntyre plans to put athletics career back on track.’ 1993 was also the year when she won the first ever Glasgow Women’s 10K Road Race. The race, famous for both the quality of athlete at the ‘sharp end’ and the huge numbers of runners taking part is still being run and Lynne is still racing in it. If you go to YouTube and type in ‘Lynne MacDougall’ you will get a film clip of her finishing first in the 2009 race. The athletics jury which has already condemned 30-year-old Lynne McIntyre one of sports under-achievers may yet have to reconsider. Twelve years after she was the youngest Olympic 1500m finalist at 19, the City of Glasgow woman hopes to return and win selection for Atlanta in the same event. Why not? She has overturned a catalogue of disasters, any one of which would have buried a person of lesser moral fibre. In 1984, McIntyre was seventh in Los Angeles. A week later she set a British junior 800m record (2:01.11) which still stands. Were it not for South African Zola Budd’s passport of convenience, she would also hold the 1500m mark. Charting the rise and demise of the former Lynne McDougall is simple, but behind the statistics – as many Scottish senior outdoors titles as Commonwealth champions Liz McColgan and Yvonne Murray combined – and the belief that she can run faster after a 12 year absence, lies a saga of triumph against emotional and physical adversity. The death of her coach, and then her father, painful injury, surgery, and then divorce – all while earning an honours degree and a distinction in a post-graduation Masters – conspired against her. Budd and McIntyre, the two youngest in that 1984 team, exchanged little conversation, with Budd a cloistered pawn in a newspaper circulation war. However McIntyre, dismissing two Commonwealth Final appearances as incidental, hopes to have the last word. Just two months after her seventeenth birthday, belying her frail physique, she won the Scottish senior 1500m title, setting a senior native record. It survived a week, broken by future Commonwealth 10000m champion Murray – one year her senior. Two years later McIntyre won the national senior cross-country title with Murray second. And when Murray won the 1986 Scottish 1500m title, the older McColgan – later that year to become the Commonwealth 10K senior champion – was runner-up. 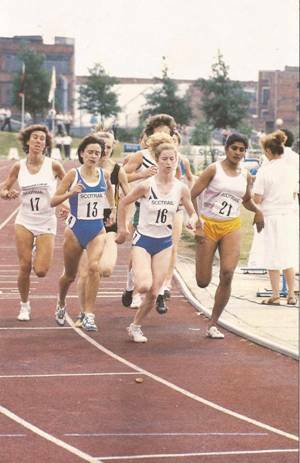 In 1989 she set a Scottish championship 1500m record which still stands, and the future European and World finalist, Alison Wyeth, was runner-up when McIntyre won the UK 1500m title. The top time of 4:17.10 ranked her fourteenth in Britain. She had also run 2:08.37 for 800m which placed her fourth in Scotland and 36th in Britain. In July however, there was a Scottish silver and bronze at the British Championships in Sheffield with Yvonne Murray (15:39.08) second and Lynne third (15:43.03). There was also a road 5K in 17:15 which was sixth best time by a Scot that year. The Annual Yearbook commented, “Lynne MacDougall’s successful comeback continued with a list topping of 4:17.10 – the slowest time to top the Scottish rankings since 1977 – a year when a 12 year old Miss MacDougall appeared in the lists for the first time with a 4:52.3. She also won her fourth National in a close finish with Irish holder Ann Tevek.” In 1997 her road racing had gone up to 10K and she was third in the rankings after winning at Ayr in 33:42. On the track she had four of the top seven 1500m times (4:12.4 at Crown Point in August, 4:16.6 at Sheffield in February, 4:20.1 at Enfield in June and 4:22.8 at Grangemouth in July) prompting the following comment from the statisticians: “32 year old MacDougall took advantage of a mixed race at Crown Point to record 4:12.4 – her fastest run since 1990 – and recorded four other winning races under 4:24 with a victory in Malaysia in 4:23.7 in thick smog in September.” The Malaysian race was an interesting one: Lynne had been sent on a fact-finding errand by Scottish Athletics to Kuala Lumpur ahead of the following year’s Commonwealth Games and while there, they had won the Malaysian Championships (‘despite 80% humidity and serious air pollution’)! Also in 1997, Lynne had three of the top five Scottish times for the 5000m – 15:45.03 in Sheffield in June placed her second, victory at Crown Point in 15:51.7 in June placed her third and 16:04.01 at Birmingham when she was third behind Yvonne Murray in July placed her fifth. The rankings in 1998 took an interesting turn in that there were ranked places in three road races and only one track position. The statisticians said in their yearbook, that she had concentrated on road running that year and certainly her placings showed that. In road racing, Lynne was first in the rankings for 10 miles when she won in Manchester in August with 55:58, second for 5 Miles when she won in Glasgow in February with 26:23, and third for the 10K when she was first in Belfast in 33:32. On the track she had second and sixth in the 5000m – 16:01.41 when finishing fifth in Turku, and 16:21.8 when winning at Crown Point in August. Unfortunately, because of injuries she could not run in the Commonwealth Games. Unfortunately in 1999, Lynne appeared nowhere at all in the ranking lists. The injuries that had denied her a third Commonwealth Games after she had been one of the first to be selected, had not gone away and were still causing her some difficulty. Despite appearing on no fewer than five Scottish all-time ranking lists, Lynne in 2001 stuck to road running where the ability that had her as one of the best ever at distances from 800m to 5000m on the track indicated that she was certainly one of the best of her generation on this surface too. As a V35 she was ranked second to Hayley Haining at 10000m with her time of 34:30 when finishing eighth at Cheltenham in September and topped the lists at 10 Miles (55:28 when winning at Carlisle in November), half marathon (74:24 when finishing in fifteenth in the Great North Run at South Shields in September) and in the marathon (with 2:37:40 at London in April). As far as championships were concerned she won the Scottish 10,000m with a time of 34:41 and it was her second national title at the distance with the first being in 1993 when she was timed at 34:28. In 2002, she retained her first place in the marathon rankings with the improved time of 2:36:29 when finishing second in Seville in February. This gave her the qualifying time for the Commonwealth Games in 2002. But there was an unexpected problem. Doug Gillon covered it with his article in the ‘Herald’ of 14th June that year. Under the headline “Injury Gives MacDougall Much To Chew Over”, he said: “Scotland yesterday confirmed the first three places in the Commonwealth Games team for Manchester: Marathoners Simon Pride and Lynne MacDougall and Sarah-Jane Cattermole for the 20K Walk. An Olympic finalist 18 years ago in Los Angeles, MacDougall reached the Commonwealth Games 1500m final in 1986 and 1990 but ran her fastest marathon in Seville earlier this year. She is an uncertain starter for the Bank of Scotland team however. “I have a back injury which may be related to my teeth, perhaps my bite is out of alignment, and have missed some training,” she said. “I am to see a specialist and will go only if I am fit enough.” As it turned out, she didn’t think she was and missed the Games. Doug from the ‘Herald’ on 31st August 2002: “City of Glasgow’s MacDougall ruled herself out of Scotland’s Commonwealth Games team with a back problem. She was a bitterly disappointed spectator when the Manchester bronze medal went with a 2:36:37 which was 15 seconds above what she had run in Spain. “It’s been a bit de-motivating,” she said. “I haven’t raced since that marathon but my back injury has gone and I’m back in training.” Her other ranking places in 2002 were third in the 10000m with 34:19 recorded when winning at Paisley in September and third in the half marathon with 76:24 which she ran at Glasgow in September when she finished tenth. 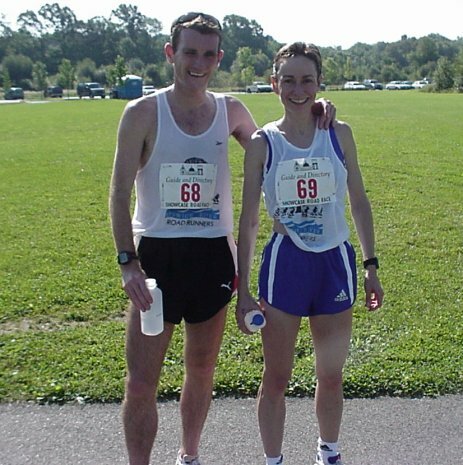 Incidentally when she won the half marathon at Alloa in March, Allan won the men’s race to reprise the American result from 2000! She appeared only in the 5 Miles and 10K ranking lists in 2003 – fifth with 26:08 in February for her run at Alsager in Cheshire and sixth with 35:24 two weeks later at Grangemouth where she finished second – but the Annual Yearbook noted that Gillian Palmer, Kathy Butler and Lynne MacDougall were all injured in 2003 which left the way open for such as Susan Partridge and Hayley Haining over the shorter distances and Trudi Thomson over the longer ones. It was now five years since her last track race and although still racing well her career at the very top was by now over. However, unlike many of her rivals she kept her love for the sport and kept on racing domestically: in 2005 she was third in the 5K Challenge in Glasgow with a time of 19:43; in 2007, by now a V40, she is on the record as having run run a 3K in November round Glasgow Green in 10:51 after having already run two 10K’s, in 37:34 in May and 37:56 in June – all three were in Glasgow. Lynne ran the Women’s 10K in Glasgow in 2008 in 38:09, in 2009 in 38:54, in 2010 in 38:49 and in 2011 in 39:21 (second V45). Settled now and living on the south side of Glasgow with Allan and their son Josh, with a good job which she loves at Glasgow University, she is very contented with her life but continues to run – and I believe she will continue to do so just because she loves to run. She is still mentioned in despatches (eg in the ‘Sunday Herald’ preview of the 2009 Glasgow Women’s 10K there is a this: “25 years after she was the youngest Olympic 1500m finalist, Lynne MacDougall, now a mum, is in action again …). There was also another excellent article covering the various aspects of her career as a runner, student, graduate, mother, etc, in ‘The Herald’ of 3rd May 2010 in the course of which she says “I’m retired, so I only run four times a week.” Her running career was stellar and, but for the dreadful injuries and the toll they exacted, it could have been even better. She is an excellent advertisement for the sport and indeed a first class role model for any young sports person.